Growing up Christmas was a big deal to my Mom. She always crammed the house and yard with lights, decorations and music. We had lots of traditions at Christmas time. For example every Christmas Eve we would eat split pea soup (which is surprisingly good despite the similarity to baby poop) and go to the late service at church. Christmas Eve my cousin and I always got to open one gift and it was usually a pair of pajamas. Sometime close to Christmas we would all pile in the car and go drive around looking at lights. During the month of December my Mom, Brother and I always made tons of homemade candy. There were 7 layer bars, fudge, divinity, orange balls, chex mix, cookies, etc. We would pass it out to our neighbors and friends and eat it until we were sick. 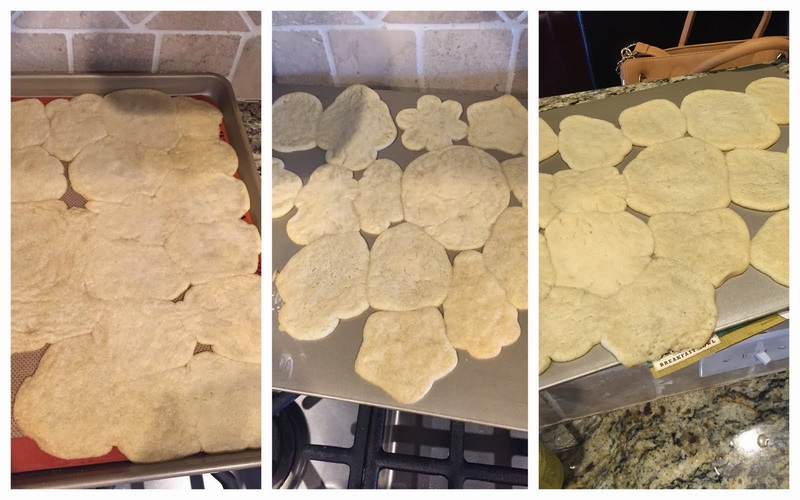 Every year my Mom would make sugar cookies in all sorts of shapes and then my cousin and I decorated them. We thought we were quiet the artists. I have always loved Christmas. I don't go all out like my Mom used to. I don't like a ton of flashy decorations. Simple is best in my book. But, I still decorate a lot more than I do any other time of year. When Mr. Mayer and I were first married I used to make candy every year. I have my Mom and his Mom's candy recipes. However, somewhere along the way I have stopped doing that. As I type this I am thinking to myself that maybe next year is the year to pick that tradition up again. I don't force split pea soup on my family, though if I'm honest I do still have a craving and desire for it. Mr. Mayer has threatened mutiny if I ever try to make it though. #2 hates most food in general and I can only imagine what he'd do if I made split pea soup. #1 might pass out from disgust. We are hit and miss on looking at Christmas lights. So far it hasn't happened this year. One tradition I have continued since I had #1 is decorating sugar cookies. I invite some friends over and we have a big ol' messy decorating party. In the past I have made the cookies and cut them out. This year I thought I would cheat and buy premade dough. Easy peasy. No big deal at all. I also decided that the kids were old enough to help cut the cookies out. I needed to let go of some of my control and let them do it. I got this. I had 4 tubes of dough. Everyone got their own dough to cut out. I pulled out all my cutters. My Mom gave them all to me years ago. Some are at least 50 years old and the ones I used as a little girl. 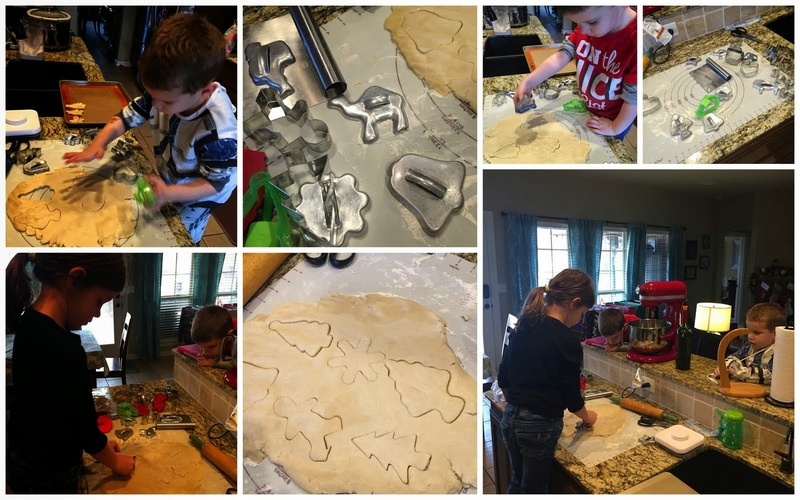 The kids and I spent over an hour cutting cookies and talking about traditions and how old the cutters were. Everything went so smoothly. I popped them in the oven and let them bake. We had 5 trays of cut out cookies. Our friends will be here at 4pm. 14 minutes passed and it was time to remove the cookies.....I'm sure you can guess where I am going with this. I didn't think about the dough I used spreading. The recipe I use doesn't spread much at all. I didn't consider my fancy premade dough would spread. O. M. G. I pulled out tray after tray of deformed cookies. You can't even tell what shape these things started out in. *Sigh* I'm glad my target audience today isn't picky. Most of them still eat their boogers. Because these cookies are a hot mess. They will decorate just the same though.